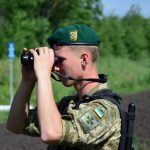 The agents of the Western Regional Department of the SBGS provided the border guards with the information about foreigners’ stay in the suburb of village Onokivtsi, Uzhhorod district. Reaction group started to the place immediately. The unknown persons were found and detained a kilometer before the state border. Both men had passport documents of the Indian citizens. In the course of the verification measures it was managed to establish that the foreigners intended to get to Slovakia beyond the check points. The citizens of India are brought to administrative responsibility under Part 2 Article 204-1 of the AICU “Illegal cross or attempt to cross the state border of Ukraine”. This entry was posted in Translated Media-News from Ukraine and tagged foreigners, india, Ukraine on September 21, 2018 by oksana.